Crime hot spots in Toronto appear to be concentrated around the city core and the northwest, police data obtained by CBC News suggests. The crime data for 140 Toronto neighbourhoods over the last seven years has been plotted onto an interactive map by CBC News. Data has been organized into the following categories: assaults, sexual assaults, break-ins, robberies, drug charges, stolen vehicles, thefts over $5,000 and homicides. Across the board, downtown neighbourhoods have come in at or near the top of the list when it comes to the number of per capita criminal occurrences in 2011. The Bay Street corridor, for instance, has the most per capita assaults and robberies in Toronto, and ranks third out of 140 neighbourhoods for most drug charges per capita. First for per capita drug charges. Second for per capita assaults. Fourth for per capita break-ins. Seventh for per capita sexual assaults. Second for per capita sexual assaults. Third for per capita drug charges. Seventh for per capita robberies. Eighth for per capita assaults. Eighth for per capita and break-ins. Brookhaven-Amesbury in the northwest ranked highest for per capita sexual assaults, while Bedford Park-Nortown in central Toronto had the most per capita break-ins. Elms-Old Rexdale in the northwest had the most per capita thefts over $5,000, while Yorkdale-Glen Park in central Toronto had the most per capita vehicle thefts. 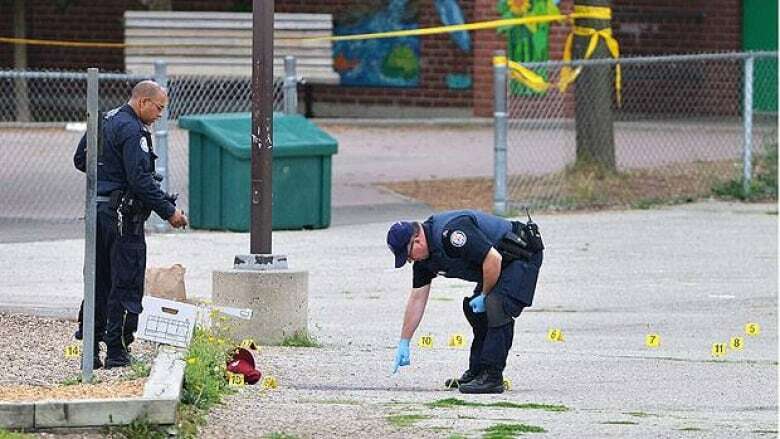 Toronto police spokesman Mark Pugash said it's important to treat the numbers with caution, saying they have limitations and that police look at a number of different variables before determining how and where to deploy resources. "What [police] look for is a much larger picture. We'll look at the history, the trends, criminal intelligence, demographics, a wide variety of factors before we come up with conclusions about what it all means," he said. He also said there is a "slight risk" in calculating per capita criminal occurrences for neighbourhoods, as CBC News has done on its neighbourhood crime map. "Because I think most people accept that in this city, during the day and at night and at weekends, there is a much greater influx of people from outside the city that elevates the numbers," he said. "So if you go on Toronto population [numbers], you're missing all those people who come from the GTA — who come in for the entertainment district, who come in for sports events, who come in for large cultural events and other things." Some of the assaults and other criminality that occur in the downtown may be a result of the relatively high concentration of bars and nightclubs in the downtown core. Dr. Glen Bandiera, the chief of emergency medicine St. Michael's Hospital, located just east of Yonge Street and north of Queen Street East downtown, confirms that the emergency room sees an increase in personal injuries from Thursdays to Saturdays, generally late at night or early in the morning. Many of the injuries in those hours "are consistent with interpersonal conflicts," such as punches, kicks and assaults with blunt weapons, said Bandiera, who added his department also provides care for a significant homeless population. He said an increase in the number of people moving into the downtown in recent years may have something to do with an increase of about 10 to 11 per cent of people being admitted to the emergency room at his hospital each year in the last two to three years. The population of the waterfront communities — on the Island, for instance — has jumped 133 per cent between 2006 and 2011. The population of the Bay Street corridor has jumped 37.7 per cent in that same period. "One could argue that the process of more people trying to get into fewer clubs actually causes problems, because people are frustrated and they find other ways to vent their frustration," he said, adding alcohol and drugs "are big players in a lot of the assaults." Adam Matthias, who works in the Bay Street area downtown, said he was surprised at some of the downtown crime numbers. "It's only as safe as you make it. If you're going to go into a dark alley … you're going off the beaten path, whereas Bay Street? I'm happy." Alex Balch, in the George Street area in the Moss Park neighbourhood, said it's more important to change the causes of crime than focus on statistics. "Really, the root cause of it is, like, a very concentrated level of poverty and homelessness and lack of housing and then substance abuse."